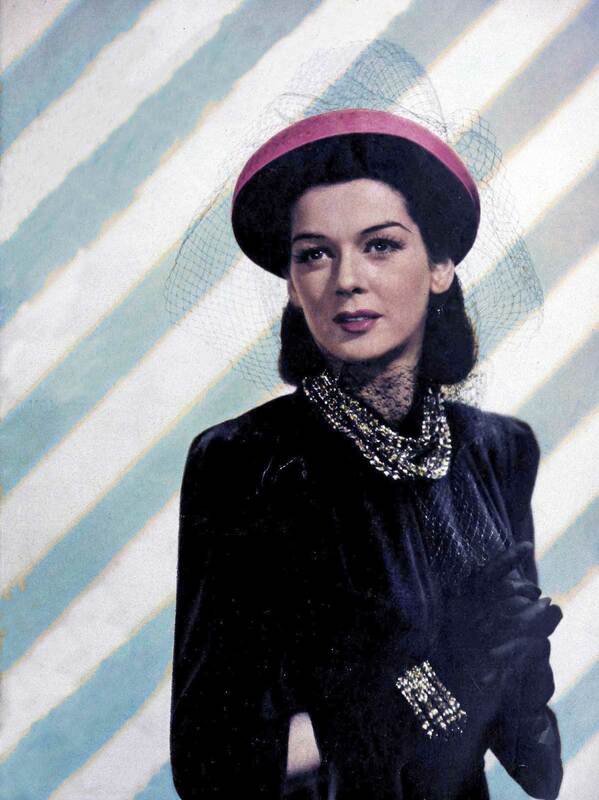 Rosalind Russell poses in a fall costume from Bonwit Teller, New York. The felt bonnet is the highlight of this lovely ensemble. A Fall coat and dress to catch the eye. Money pouch pockets shirred to carry out the shoulder design on a dress otherwise definitely tailored. Of rayon crepe in wineberry, it is formal enough for high tea. Smart enough for a class room and simple enough for the office. High neck and sleeve, its bodice and pleated skirt fits snugly over your foundation wear. 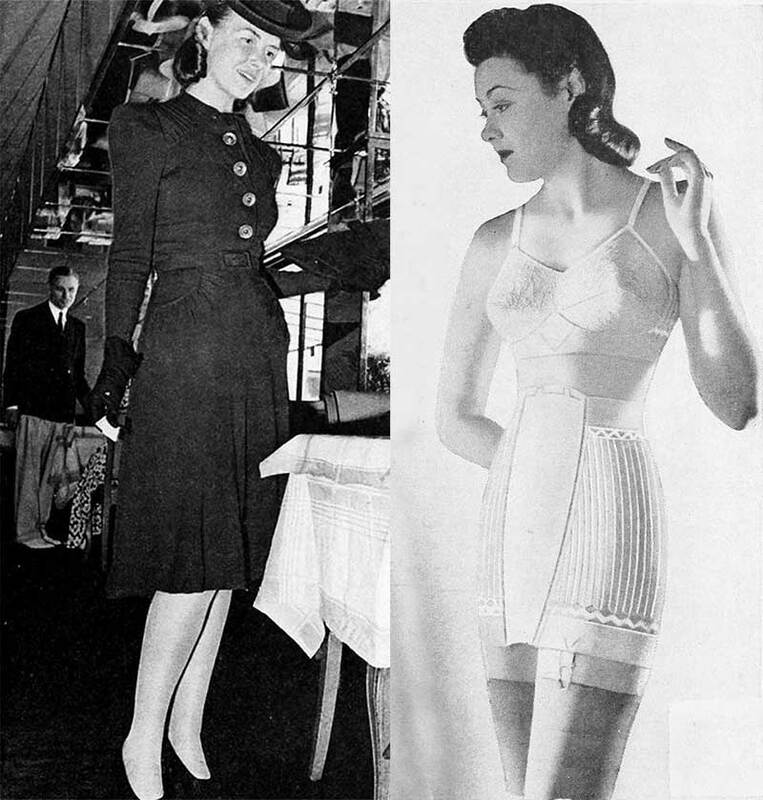 Featured girdle and bra by Real Form. Perfectly snug for the coming cold months. Left: Kitty Foyle dress with pin tucked bodice, sleeves and pockets. Fitted regular style coat by Londonderry. Shirt waist collar. Hats by Hinchley and gloves by Alexette. Right: Mink as a luxury note. Crowning this simple, straight-lined coat is an inverted pouch collar of lustrous mink. Combining smartness with serviceability. The coat itself is an all-wool Julliard fabric, woven as closely as needlepoint. The full bishop sleeves taper to a fitted band at the wrists. Two dark black Fall dresses are bought vibrantly to life by knowing use of jewelry. Left: Monet bag pocket on a simple rayon crepe dress. High neckline sets the stage for infinite jewelry. Shirring at the yoke gives subtle grace. Right: Inset band arches over the bosom of a slender rayon crepe dress. Black as charcoal stick. Deep shirring around the band to soften its stark simplicity. High V-neck. Belt of gold or silver metal interlaced with crepe. Left: Classic dress is a field green rayon crepe. The news here is the double fly front top and cash pockets buttoned over a calf belt. Right: Coat and skirt of cross-dye Shetland for a grey suit. Classic coat goes over everything; skirt mixes like magic with other tops. Blouse as shown below. For both costumes – calf oxfords in black with perforated toe. Good heel to offset wear and tear of office errands. Blouse of white rayon crepe with full long sleeves. Close-fitting cuffs. Capeskin gloves and a soft calf bag, both in black. Left: Reefer coat, warm and slender for the career girl. Smooth black tweed with the spanking new RAF collar. Black felt pompadour hat. Right: A blue cashmere dress, tailored so well it could be worn inside out ( almost!). Black kid buttons trickle down the side; black kid belt marks the waist. For both costumes: Black suede pull-on gloves. Black calf shoes with suede in-step and midget calf bow. Shirred calf zip-top bag in black with faille handles. Images @ The Conde Nast Publications, Inc.